For our bachelor thesis study, I teamed up with my classmate Andreé. 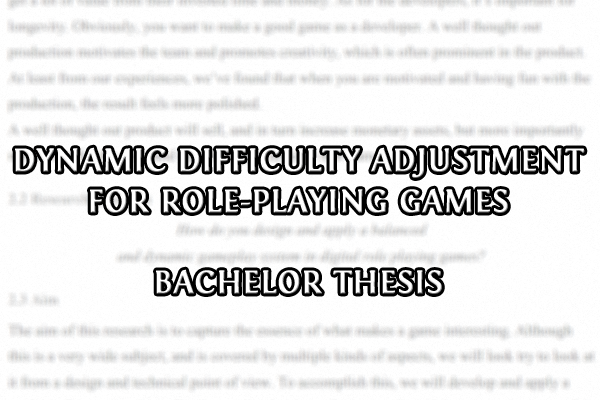 After discussing topics that we were interested in studying, we eventually landed at dynamic difficulty adjustment. This thesis details our studies and sources, how we’ve applied them, what results we’ve reached and how one could go forward from where we left off. If you’re interested in the concept of having dynamic difficulty in digital games, I would say it’s definitely worth a read. Other than writing the thesis, we also worked on a game project alongside, practically employing the system that we designed called PAD (Player Adjusted Difficulty.) The game itself is called Eira’s Tale, which you can read more about if you click the name. The download link is below, enjoy the read!